For this upcoming season, the Westchester Youth Soccer League(WYSL) will be using the GotSoccer scheduling system. This document will help you with the basics of filling out the seeding application. This application will need to be completed for each team that will be participating in the Spring 2019 WYSL travel season. There are some differences between the GotSoccer system and the old system so we will be hosting an online training session at 7pm EST Thursday, Dec 13th. For those that would like to attend, please go to Join.me/GotSoccer7 at 6:55pm to join the meeting. There will be additional in-person trainings held in January regarding the scheduling process with additional information to follow. If you do have questions in the meanwhile, feel free to reach out to Jared@GotSoccer.com for assistance. Here are the answers to a few questions that have come up. 1) Will I need to create a username and password for each team in order to fill out the seeding form? Yes, you will need to create one for each team, if they do not already exist in our system. This is a one time action and only adds 10-15 seconds per team to the seeding form. 2) What is the purpose of the team username and password? The username and password for each team will allow the coach/manager of that team view their individual schedules, communicate with opposing teams, enter scores, and various other items. You should create a new username and password for that team so that the form can be filled out. 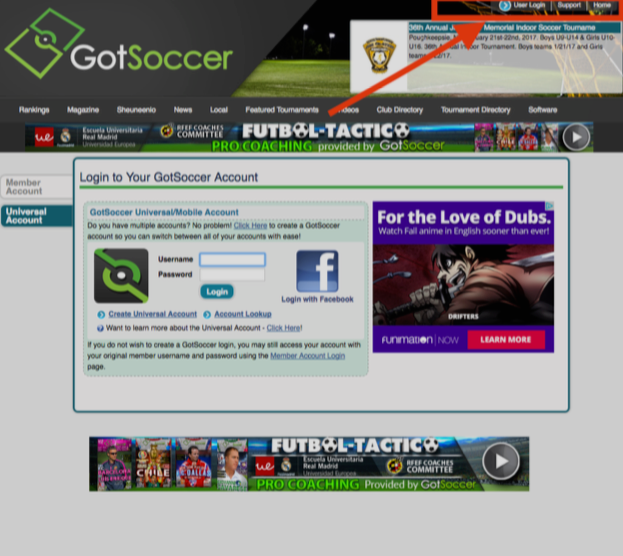 GotSoccer can merge these accounts at a later point so that there are no duplicates and their history is maintained. The club admin account (which has not been sent out yet and do not need for the seeding form) will be able to email all teams their username and password. 3) If the team already exists, but I don’t know their username and password, what should I do? 4) If a club admin creates the username and password, how will the coach/manager of the team get it? 5) What will I be able to do with my club admin account? You will be able to see all teams that have submitted their seeding form, communicate with your teams, view your teams’ schedules, view your teams’ usernames and passwords, update your club’s members, and various other items. Instructions for all of this will be given during the online training and via a pdf document that will be sent out after the meeting. The pdf document will also be posted on the WYSL website. 6) As a club admin, is there a way for me to find out what the username and passwords are of my existing team? Yes, via your organizations club account. We are currently building this database and will be sending out the logins soon. 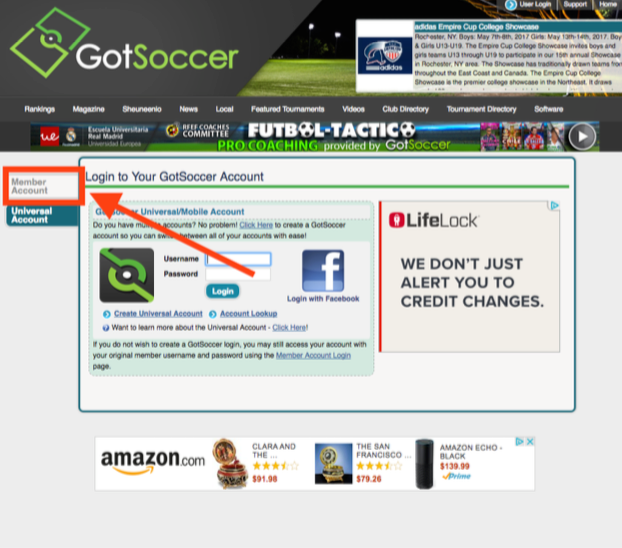 If you would like to get a head start, feel free to reach out to Jared@GotSoccer.com, and you will receive assistance in gaining access to your club account. 7) Where do I enter my fields and scheduling requests? Instructions for these processes will follow and these do not need to be submitted at this time. 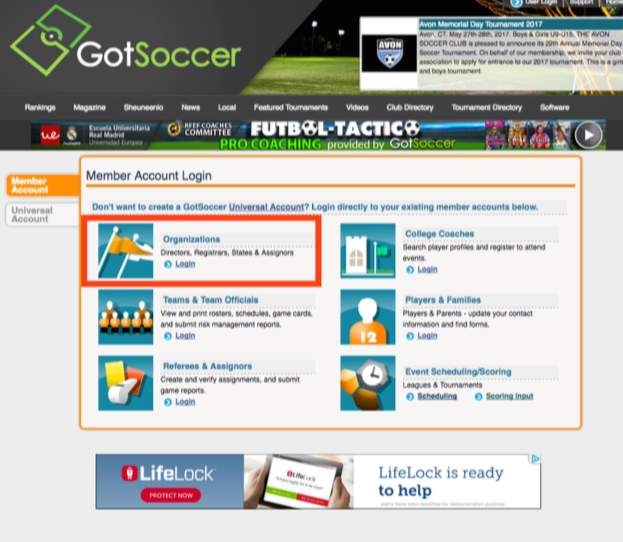 Your GotSoccer club account is where you will be able to manage all of you players, coaches, managers and teams. Club accounts can also be used to collect online registration information, send emails, and print official rosters and cards. 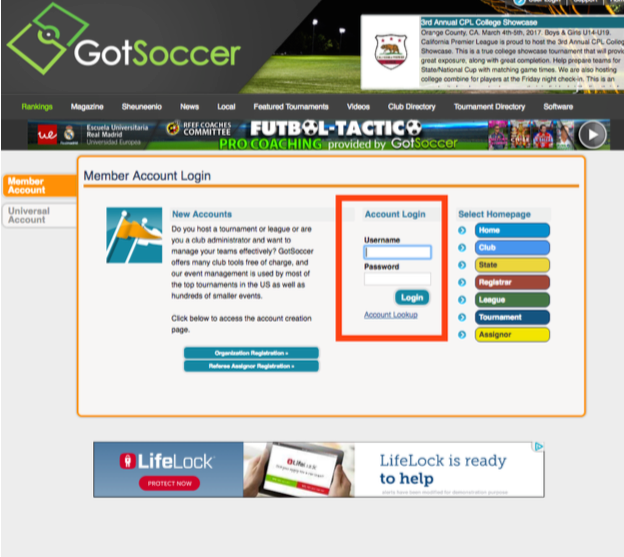 In order to log in to your club's account click "user login" in the top right corner of the GotSoccer home page. Next you will click on "Member Account" on the left-hand side of the page. Next you will click on "Organizations"
This will bring you to the page to enter log in credentials, enter user name and password in the member account log in.